I have another pretty Christmas card to share with you. This card shows of the beautiful Die-namics Tree Lines die that The Cutting Garden is stocking this year…. It is hard to see in this post but I used beautiful shimmer white paper for both the die cut and embossed panels. I added some gems and tinsel trim to give it a bit more sparkle. I was surprised at how quickly this card came together! This is going to be another Christmas card that I plan on sending out this year. I love the simple design and also that I can just pop it into the mail. Wow, stunning card. I love the all white design with the pops of silver. So elegant. What a lovely card! I like the tree die. 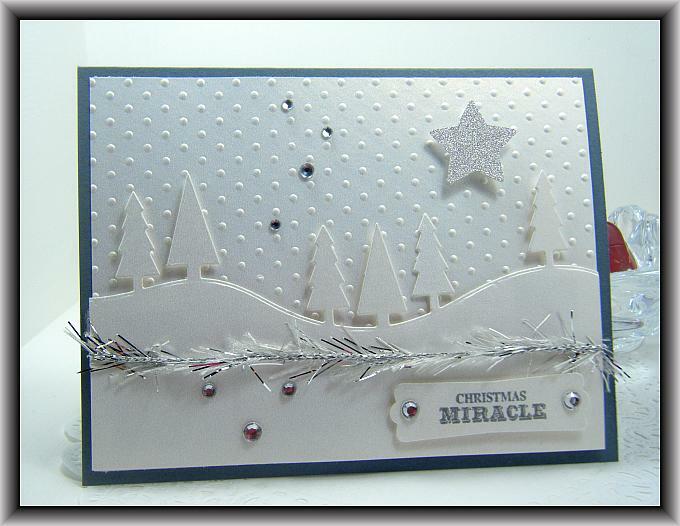 How creative to use the dots embossing to create snow!